I grew up with a grandfather who was a retired police captain. Needless to say, respect for police officers was a highlight of my upbringing, and until I moved away from the small town in which I grew up, I never understood why people would feel uncomfortable in the presence of law enforcement. 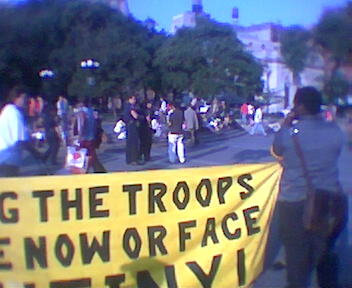 In the summer of 2004, I went to some protests in Union Square, a small park in lower Manhattan near where I was living where political speech was (and still is) a mainstay. I didn’t go to protest — if anything, my 20-year-old self thought it would be more entertaining to watch the crazy hippies, liberals, and even communists ranting on a megaphone about how much they hate George W. Bush. It was, in fact, the first time I met someone who would openly and happily proclaim they were a communist. All very strange to me at the time. The protesters would be out there almost daily, and I’d probably see them a few times a week. Once in a while, a few cops would come and confiscate a megaphone. You see, use of a “sound amplification device” without a permit is against the law in New York City, and I’ll let you guess who issues the permits. But, everything was always peaceful, and the protesters would continue with just their voices and would collect donations to go buy a new megaphone, which they invariably did, sometimes same day. At least 2 video cameras captured the incident showing that she did no such thing, and 4 witnesses, including myself, came forward to say that the charge was fabricated. The DA’s office, however, was instructed to prosecute all protesters no matter what, and they took the matter to trial, forcing this girl to endure the possibility of a 1 year prison sentence for doing nothing more than yelling at a cop. Thankfully, a jury deliberated for about 20 minutes before returning a unanimous “not guilty” verdict. The city fought against over 400 individual lawsuits, plus one class-action lawsuit with another 1,200 victims, by protesters who were arrested and beat their charges (or were never charged). Think about that for a second: during a few weeks of a convention, the city wrongfully arrested over 1,600 people. It took 10 years, but they have finally been given justice: an $18 million settlement has been reached. The incidents during the RNC cost the city (really, the taxpayers) a huge sum of money. But it also cost them my respect. It’s a sad day when you learn that your government really isn’t there to protect you. That is a little over eleven thousand dollars apiece, although the lawyer(s) probably got at least a third of the award. That is still not enough to make getting beat up, for me anyway. The 18m they’re paying is your money. They paid it out of the tax base. Good jerb. Nobody’s missing a paycheck, nobody’s fired, nobody’s sorry, nobody won here. They fucked the public and smiled as they printed the check.